Are they credible and genuine ? Image from Ref. 1 and 17 March 2017. 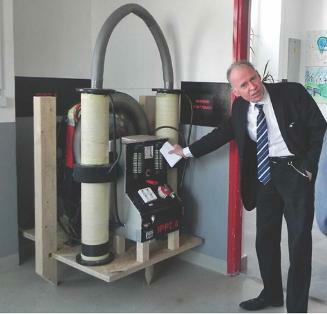 It shows Adolf Schneider in front of a generator from the company Innova Tehno at their site in Croatia. The generator is designed for permanent operation, comprises rotating parts, can be manually switched off and on, and contains a 48 V / 36 Ah battery. It was scheduled that Mrs. Ricarda Hrboka, director of Innova Tehno, demonstrates a working 7 kW generator on 30 September 2017 at a conference about entirely novel energy technologies and related topics in Graz in Austria. The planned conference program from 27 September 2017 is available here in English and in German . Several days before 30 October 2017 the conference organizers were told by somebody from Innova Tehno that the demonstration of the generator will take place as scheduled. However, on 29 October 2017 the conference organizers were informed by somebody from Innova Tehno that they have decided to cancel the demonstration. It was communicated that they do not want to present the generator and another information in public because that would currently lead to more harm than good. In principle such a decision is understandable and should be respected. However, the demonstration was promised several months, weeks and even several days before 30 October 2017. Therefore a cancellation just one day before 30 October 2017 appears not comprehensible and raises the question if the company Innova Tehno is credible and if their generator is genuine. Furthermore, around 10 January 2018 it was noticed that the website of the company Innova Tehno, http://innovatehno.eu , is not available anymore. Likewise this raises the question if the company Innova Tehno is credible and if their generator is genuine. Provided that the self-running and zero emission electromagnetic generators from Innova Tehno are genuine, then it is assumed that they extract usable energy from an everywhere present form of energy. That form of energy is called space energy, space-time energy, vacuum energy, or ether energy as presented in an information document about entirely novel and environmentally friendly energy technologies. That information document comprises also a section "Are entirely novel energy technologies and self-running generators really genuine and why does it take so long to make them tangible and commercially available ?" The author of this website thanks Adolf and Inge Schneider for various reports, presentations, and communications about the generator from Innova Tehno.